The Free Food Flows: Which Lawmakers Have Received The Most Free Meals In 2018? 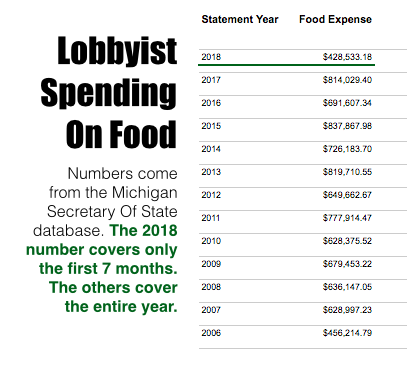 Michigan Lobbyists Have Reported Spending $428,533 On Food And Drink Purchases Over The First Seven Months Of The Year. 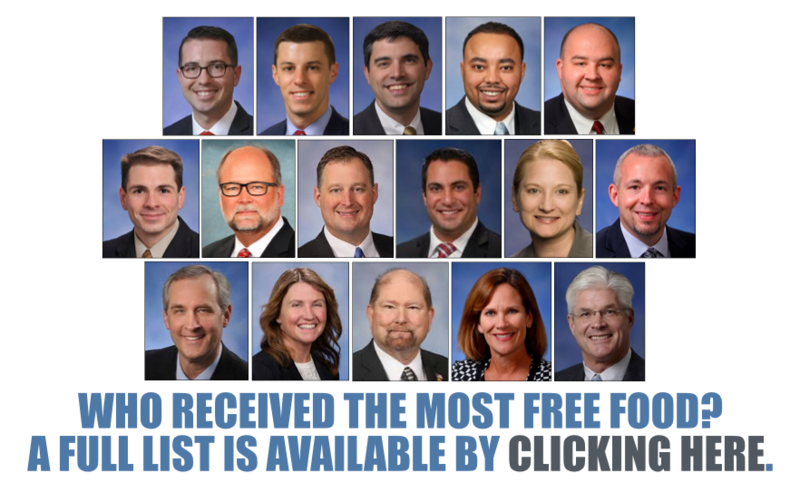 LANSING (SEPT. 18, 2018) — Sixteen state lawmakers have already received more than $1,000 in free food and drinks from lobbyists in 2018, according to new disclosures. One of those lawmakers — the chairman of the committee that regulates the alcohol industry — has single-handedly crossed the $3,000 mark for free food and drink. Four lawmakers have consumed more than $2,000 in lobbyist-funded meals each. But these numbers likely tell only a portion of the story. 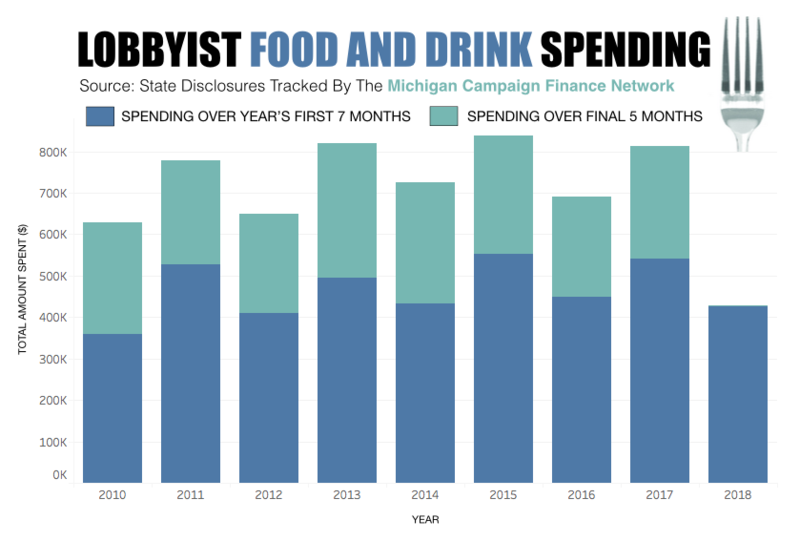 At the end of August, registered lobbyists in Michigan had to file reports on their spending for the first seven months of 2018. Overall, they disclosed $428,533 in food and beverage purchases over that time. That’s an average of $61,219 per month. The spending total of $428,533 over the first seven months of the year is down compared to the totals for the same period in recent years. For instance, over the first seven months of 2017, lobbyists reported spending $540,598 on food and drink. The record for the first seven months of a year came in 2015, when lobbyists reported spending $552,524. The fact that the spending total was down in 2018 compared to 2017 is not surprising, however. 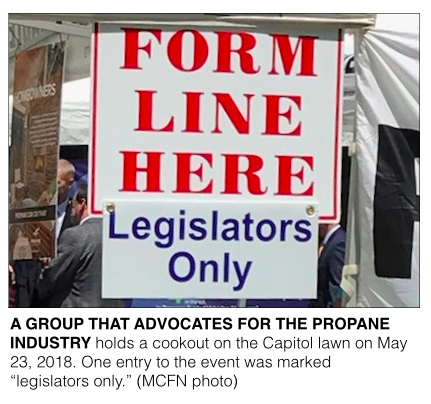 Usually, food and beverage purchases go up in non-election years when lobbyists are working to get to know lawmakers who were just elected in the previous year. The purchases then tend to go down in election years, like 2018, when lawmakers are spending more time away from Lansing on their campaigns. Figuring out which public officials are spending the most time dining with lobbyists is not an easy task in Michigan. A lobbyist only has to disclose the name of a public officeholder in spending reports if the lobbyist spends more than $60 in a month or $375 a year on that person. So of the $428,533 in total food and beverage spending, records identify individual officeholders for only $60,252 of that spending (about 14 percent). Lobbyists can also disclose buying food and drink for large groups of officeholders without specifically reporting which individuals attended. Lobbyists reported spending $183,176 on group food and drink purchases over the first seven months of 2018. State disclosure requirements also don’t cover situations where groups that aren’t lobbyists and aren’t telling lawmakers which way to vote purchase food and drink for lawmakers. Which Officeholders Received The Most Free Lunches? Two high-ranking House Republicans received the most lobbyist-purchased food and drinks from Jan. 1, 2018 through July 31, 2018, according to the new disclosures. The top recipient was Rep. Brandt Iden, a Republican from Oshtemo Township, who is chair of the House Regulatory Reform Committee, which sets rules for the alcohol industry and other businesses. Lobbyists reported buying him $3,201 in food and drinks. One multi-client firm, Governmental Consultant Services Inc., reported spending $1,107 on Iden by itself. The second-place recipient was Rep. Lee Chatfield, a Republican from Levering. Lobbyists reported buying him $2,993 in food and drinks. Chatfield is the House speaker pro tem and the chair of the House Republican Campaign Committee. If Republicans keep control of the House on Election Day, Chatfield is expected to be the next House speaker, the top position in the House. A full list of the 138 public officeholders whom lobbyists reported buying food and drinks for is available at this link. Who Picked Up The Most Tabs? When it comes to spending money on food for public officeholders, multi-client lobbying firms that are paid to represent a wide array of interests lead the way. Multi-client firms were the three biggest spenders on food and drinks over the first seven months of 2018, and they were six of the top 10 top spenders. Public Affairs Associates reported spending $55,494 on food and beverage, Kelley Cawthorne reported spending $32,906, and Governmental Consultant Services Inc. reported spending $28,068. The firms don’t have to disclose which policies they’re discussing with lawmakers or which clients they’re advocating for over the meals or drinks the firms buy for the lawmakers. Outside of multi-client firms, Consumers Energy, the Michigan Cable Telecommunications Association and Molina Healthcare were the biggest food spenders at $19,898, $9,178 and $9,119 respectively. Great Lakes Wine and Spirits reported spending $8,250, Blue Cross Blue Shield reported spending $7,604, and the Michigan Licensed Beverage Association reported spending $7,057. Molina Healthcare also reported putting on the most expensive group food event. On May 16, Molina spent $9,119 on a “legislative luncheon” for senators, representatives, department officials and staff, according to its disclosure. Other large group events included a $8,960 luncheon sponsored by the Michigan Cable Telecommunications Association on April 24 and a $8,500 “reception” sponsored by Governmental Consultant Services Inc. on May 31. ARTICLE How Can Trips Bought For Michigan Lawmakers Go Undisclosed? Here’s How.